Modern designed with a spacious overlooking the Market and the pedestrian zone of the old town balcony, Querini Deluxe Suite fulfill all the requirements for a memorable stay. 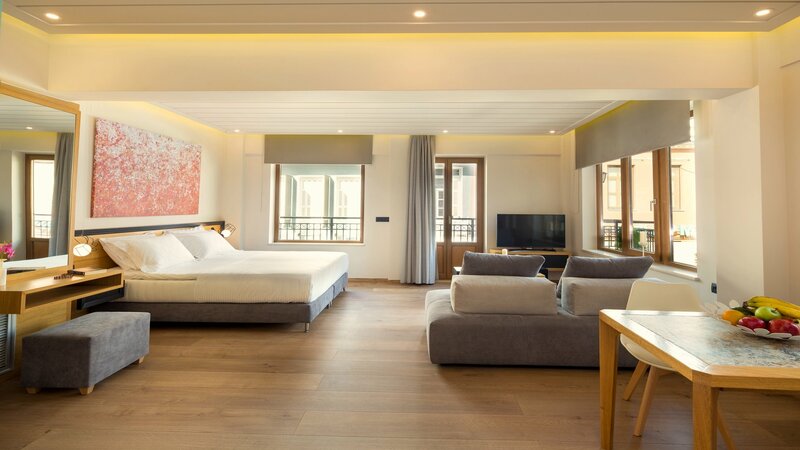 Together with special attention to detail, comfort and functionality the 35sqm suite constitutes the benchmark of every visitor’s tour to the beautiful city of Chania. Manolis went above and beyond to make sure we were thoroughly at home, and we’re ready to take advantage of Chania. He helped me find my misplaced car, and greeted us with fresh fruit and wine. He was warm, genuine and a pleasure to encounter. Excellent accommodation. I visited with my wife for a romantic city break. The location is just in the hart of the old town, however a public parking was just a few feet away so we could also use our car. The room was as described in the photos. Sound design, high quality decoration, excellent bed. It was clean,and comfortable. Despite the fact that its located exactly at the center of the old town (behind the Agora) it is very quite. Walking distance to the most important sites and all amenities. Excellent breakfast service. Sound communication with the staff/administrator (Manolis is the man!). It was a short visit, we’ll definitely come back for more (my wife loved it)! The suite is absolutely fantastic! Super luxurious and it’s located in the heart of the town, very close to everything. The place is very clean and spacious, all furniture is brand new and very comfortable! Manolis (the owner) was very polite, friendly and helpful! This suite is definitely value for money and exceeded our expectations. We will surely come back again just for this place! !